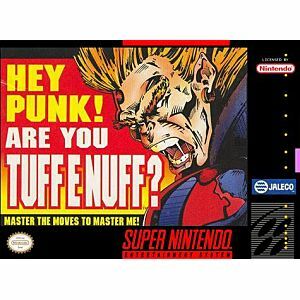 Tuff E Nuff for Super Nintendo has four brave warriors who have traveled from distant lands to take their turns at overthrowing Jade, but they must first determine who is the strongest. The four will enter a series of contests in the Coliseum, with the winner earning the right to climb the menacing tower in which Jade waits. Unfortunately, the tower is guarded by six psychotic enemies each a little more vicious than the last.